Welcome to our Gift List service, a free to use gift list featuring the UK's widest range of gift vouchers and gift cards. Unlike some other gift lists the Voucher Express Gift List has no commission charges, no hidden fees or tie-ins (such as minimum usage charges or early exit fees), and there are no delivery charges. Your own homepage is free to register, set-up, customise and use. Once your Gift List is closed we can deliver your gifts within two working days. 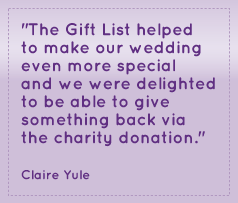 You can also choose to donate up to 10% of your final fund to a chosen charity; and we can supply free stationery to hand out to your guests or donors. Voucher Express Gift Lists are not only perfect for weddings but also for anniversaries; retirement, holiday funds; Christmas saving schemes, birthday wish lists and baby showers. Start adding gifts to your Gift List and set how much you'd like to receive. Your choices can be edited at any time. Alternatively, leave your Gift List as an 'Open Pot' and decide what gifts to choose when you close the account. Send your Gift List Event ID to your guests and donors - we provide free Gift List inserts for this. Guests and donors can add to your Gift List via the web or telephone. You can choose to get email notifications every time a new pledge is made. Check the balance of your account at any time; view your messages and manage your gift selections. When you come to close your Gift List we'll be in touch to confirm your final choices and arrange delivery. Your gifts will be sent, free of charge, using Special Delivery within two working days. That's the basics, for more information please view our FAQs section or if you'd prefer, send us an email and we will try our hardest to answer any question you throw at us.